The 2014 Asian Games is the largest sporting event in Asia governed by Olympic Council of Asia. It is scheduled to take place in Incheon, South Korea from September 19th - October 4th, 2014, with 439 events in 36 sports and disciplines set to feature in the Games represented by 9,501 Athletes. Guangzhou : The skies lit up with dazzling fireworks as an emotional China brought the curtains down on the biggest Asian Games in a riot of colour, foot-tapping music and a cultural extravaganza at the Haixinsha Island on the Pearl River. Deep Rooted in the Far East Championships, the modern 'Asian Games' was founded in 1951 inspired by the sports and games competition between China, Japan and the Philippines between 1913-34. These Asian Games were organised by the Asian Games Federation (AGF) till on December 5, 1982 when the Olympic Council of Asia (OCA) came into existence in New Delhi during the IX Asian Games. The primary goal of this organization, Olympic Council of Asia (OCA) is to promote and propagate the importance of an Asian identity and foster unity amongst Asians through sports and games. 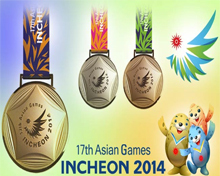 The Asian Games truly represent the Games of Asia in every four years. In 1951 in New Delhi, India; Asian Games had 11 nations and 489 athletes in competition. The Asian Games were organised at a number of places like Manila, Tokyo, Jakarta, Bangkok, Tehran, Seoul, Beijing, Hiroshima and Busan. The emblem of the Asian Games consists of the five Olympic Rings (which were added in 1983) and an Orange Sun at the top. Whereas the Olympic rings boast of its grandeur that resembles to the Olympics, the Orange Sun represents the warmth inherent in the Asians. The Olympic Council of Asia is thus committed to develop the physical and moral faculties of the Asian Youth though friendship, international respect and the goodwill amongst the member countries. Kathmandu, June 12 (IANS) An earthquake measuring 5.3 on the Richter scale hit Nepal on Thursday night, a media report said on Friday. View More..
Kathmandu, June 10 (IANS) CPI-M secretary general Sitaram Yechuri, who played a crucial role in bringing Nepal's radical Maoists to mainstream after 2006, has hailed the understanding reached between the Himalayan nation's political parties in the aftermath of the devastating April 25 earthquake. View More..
Kathmandu, June 10 (IANS) Nepal will witness a weak monsoon this year and that too will be delayed by a week, the country's department of hydrology and meteorology said on Wednesday. View More..
Kathmandu, June 10 (IANS) Saudi Arabia on Wednesday sent 15 more tonnes of relief material to quake-hit Nepal as it met its commitment to send 190 tonnes of relief material from the Gulf nation. View More..
Kathmandu, June 10 (IANS) Nepal's Finance Minister Ram Sharan Mahat left for New Delhi on Wednesday to invite Indian Prime Minister Narendra Modi to an international donor conference being hosted here on June 25 to raise funds for reconstruction following the damage caused by the devastating April 25 earthquake. View More..
Kathmandu, June 8 ( IANS) Nepal's annual growth will be significantly lowered from over 5 percent to 3.04 percent, according to the Central Bureau of Statistics (CBS). View More..
Mumbai, June 7 (IANS) Singer Tochi Raina of 'Kabira' from "Ye Jawani Hai Deewani" fame, and Max Fashion have joined hands to do their bit for earthquake hit-people of Nepal. View More..
Kathmandu, June 7 (IANS) As many as 55 bodies, including of four foreigners, were recovered by the Nepal Army and villagers in a joint effort in Nepal's Langtang valley on Saturday and Sunday, police here said. View More..
Kolkata, June 5 (IANS) Branding the April 25 Nepal earthquake as a "catastrophe", its consul general said here on Friday that the situation in the Himalayan nation is gradually normalising. View More..
Kathmandu, June 4 (IANS) The final de-induction of the Indian Combined Armed Forces Task Force on Thursday marked the winding up of Operation Maitri -- the biggest post-disaster operation ever launched by India outside its territory -- in the earthquake-ravaged Himalayan nation. View More..
Dharamsala, June 4 (IANS) The Central Tibetan Administration (CTA) here on Thursday announced an additional Nepali Rs.3 crore for relief and reconstruction work in the earthquake-hit country, a statement said. View More..
Kathmandu, June 2 (IANS) The Nepali Congress -- major partner in Nepal's ruling coalition -- and the London-based human rights watchdog Amnesty International (AI) on Tuesday called upon the Nepal government to end discrimination in distribution of relief material in earthquake-affected areas of the Himalayan nation. View More..
Kathmandu, June 2 (IANS) The UN said on Tuesday that approximately 2.8 million Nepali people affected by the April 25 earthquake and aftershocks were in need of humanitarian assistance. View More..
Kathmandu, June 2 (IANS) A helicopter engaged in relief operations for earthqauke victims crashed in Nepal's Sindhupalchowk district on Tuesday, killing all four people on board. View More..
Kathmandu, May 31 (IANS) Schools in Kathmandu valley and other affected districts in Nepal -- devastated by the April 25 temblor -- reopened on Sunday after a five-week break -- but to sparse attendance. Only 25 percent of scholars attended, Nepal's education ministry said. View More..
Kathmandu, May 28 (IANS) Nepal has banned child adoption in the country in an effort to curb human trafficking, especially of girl children who are at risk of falling victim to traffickers, in the wake of the April 25 earthquake that claimed thousands of lives and left a huge section of the population homeless. View More..
Kathmandu, May 28 (IANS) Indian doctors will assist Nepal's own physicians in organising mobile health camps to tackle any likelihood of outbreak of epidemics following the devastating temblor last month and ahead of the impending monsoon, a top official said. View More..
Kolkata, May 27 (IANS) Members of the first Indian team that scaled Mount Everest 50 years ago are planning to help out in the rehabilitation work in quake-hit Nepal, a member said here on Wednesday. View More..
United Nations, May 27 (IANS) India's assistance to earthquake ravaged Nepal has been "very welcome by that country," according to a top UN Development Programme official. View More..
New Delhi, May 25 (IANS) Indian forces are gradually scaling down their rescue and relief operations in quake-hit Nepal as the situation limps back to normal after the April 25 temblor, an official here said on Monday. View More..